Every successful business operating in the world has undergone some form of business process change; which is an essential practice for achieving growth and profitability. Change management strategies are used by business to minimise the negative impacts of risks associated with change. It outlines the standardised approaches a company uses to manage changes to business workflow, IT systems, supply chains, staffing requirements, etc. Every business change has associated risk; some changes have minimal negative effects while others have a huge impact that can even result in bankruptcy and liquidation of the business. Without effective change management strategies, the risks due to changes in a business process may be huge, sudden and unprotected. To overcome this, it is important to develop standardised strategies to assist your change management planning to ensure business changes are successful. 1. Aligned with Company Goals? Determine whether the business change is aligned with your corporate strategy and business objectives. Some business changes may be reactionary, It is best to identify whether these changes to your business will support long term goals. If you cannot create a compelling business case for the change, then it may not be worth the cost. 2. Impact on your business? Learn how the change will impact all elements of your business; positively and negatively. It will be very chaotic and almost impossible to make successful changes if you don’t have a broad and high level understanding of all the potential risks associated with business changes. Your change management strategy should outline how you will conduct risk assessment planning and mitigation of risks. Look at ways to utilise existing and proven business practices to further reduce risk. 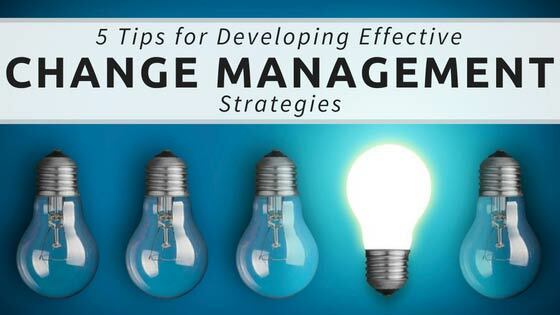 Ensure your changes have a measurable outcome and ensure your change management strategy includes a method of recording and quantifying the results of a change. Continual improvement is often associated with many management methodologies (risk, quality, etc.) and this is no different with change management. If changes are not producing the desired outcomes, i.e. increased productivity/profitability, you may need to refer to point number one and determine if your changes are actually supporting the business. Involve relevant staff and stakeholders in your change management strategy, as they will likely be the people responsible for implementing the changes that you will be planning in the future. Staff also provide an excellent source of information for identifying risks and issues that may be involved in a change process. When it comes to implementing change, your strategy should outline how you will use clear and open communication channels throughout the process to explain; implementation processes, staff responsibilities and other important details. Test your strategy on small, quick-win changes to see fast results! Successful, small changes will create business confidence around the change management strategy and allow you to fine tune where needed. Smaller changes will also carry less risk, and allow you to learn from unsuccessful changes with minimal impacts to the business. The management strategies you implement will only be successful if you and your team are willing to apply them in your business process changes. Following these guidelines does not guarantee your changes will be a success. Change management is dependant on your entire team, your resources and how willing, passionate and dedicated you are to affect changes to improve business growth and profitability.